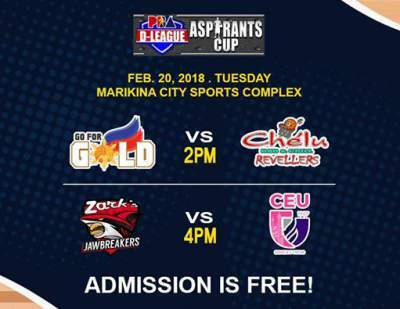 Here is the details for Go for Gold - CSB vs. CHE'LU Bar & Grill - SSC-R in the elimination round of 2018 PBA D-League Aspirant's Cup. CHE'LU Bar & Grill - SSC-R defeated Go for Gold - CSB, 87-65. Allyn Bulanadi led Che'Lu Bar & Grill with 15 points. Michael Calisaan added a double-double of 13 points and 10 rebounds. Justin Gutang paced Go for Gold with 12 points and six rebounds.